Personally, I have always believed that this thorn in the flesh may have been related to an eye problem when he was knocked off the horse and blinded for three days (Acts 9:9), which may or may not be the case. 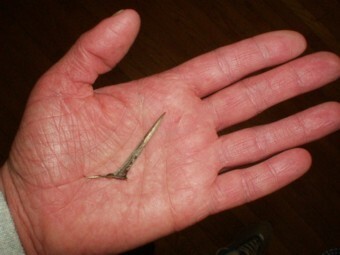 The term “Thorn in the flesh” literally means a “stake for the flesh;” which could also mean the idea of restraining someone, and in context can come to mean that there may have been a fallen Angel that was assigned to restrain his every move, which would be supported by references he made in the previous chapter of 2 Corinthians; 11:23-27. The verb translated “buffet” always refers to ill-treatment from another person or being (as seen in Matthew 26:67; Mark 14:65; I Corinthians 4:11; I Peter 2:20). The Greek word for “messenger,” utilized in 2 Corinthians 12:7, is aggelos, and is translated “angel” over a 179 times and “messenger” over 7 times. There is never an example of this word translated to reflect a disease or a physical infirmity. When utilized with the word “Satan,” such as the “Angel of Satan,” it has always referred to a Spirit Being which fell with Satan and serves him. The Greek word for “infirmities,” is astheneia which literally means “want of strength”, also “weakness;” “infirmity;” which means a moral, mental, or physical weakness or flaw. Central to this text is the idea that Paul was humbled by this thorn in the flesh. And while no doubt an affliction would be a humbling experience; going through the tribulations he underwent, the rejection, having to sneak around and hide, running for his life, along with all the other suffering he underwent; all of which would be very humbling. If our modern-day of televangelist who wear much gold, and brag about how God is glorified by his servants becoming rich, had to undergo just a little bit of the treatment that Paul had to endure, I think their pride would be alleviated, and their humility might have the opportunity to transform them into real ministers of Jesus Christ. (However, unfortunately, if they ever listened to their own messages the conclusion would have to be that they have a lack of faith, and might as well curse God and die). “Ye see how large a letter I have written unto you with mine own hand”. The book of Galatians is not that large in volume compared to some of his other books, however the emphasis is that he wrote with his own hand rather than using one of the scribes that he would normally use. The Greek word for “letter” utilized here is, Gramma, refers to that which was written, letters, or the alphabet. However, if he wished to express that he utilized larger specific letters, there are other Greek combination of words that would have expressed idea more effectively. And he does not say that he is used larger letters, plural, but larger letter, singular. So the common reading of this text does not support the idea that he is attempting to communicate that he was using larger letters in his writings because he had a hard time seeing them, due to him having bad eye sight. There is a text which is much stronger that would seem to support the idea that he had a problem with his eyes as found in Galatians 4:15, where Paul in stating the Galatians love for him was so great that they would have “plucked out your own eyes and given them to me” (Gal. 4:15). This statement makes no sense if he did not have an eye problem – other wise a statement that would make better sense would have been that would have given their very lives for him (and to some of us death is less severe than being blind). Why did God choose not to heal Paul? And could this be something that we might have to endure as well? This is an area that I feel is much more fruitful to explore than what the particular infirmity was. Because one way or another there was a trial or tribulation involved, which caused suffering for Paul. And to us living in an age when suffering is not a subject heard much from the pulpit these days (because of narcissism? ), I believe that it is part of the reason this message is so important today – because some day WE may have to suffer. And if we misunderstand that suffering is meant to cause growth, we may not respond in faith, but in rejection or a lack of faith(see the next post, part 2 of this issue of trails: “The Reasons for Trials in the Life of Believers”). Therefore, if we are not suffering persecution then are we truly living godly in Christ Jesus? We don’t want to address the idea that believers may have to suffer persecutions, or trials and tribulations; in fact the only way to grow in maturity and in faith is to go through those situations holding on to God and His Word. We want to be delivered from the Valley of the shadow of death, rather than to have Christ walked through it with us (Psa. 23:4). We do the greatest disservice to ourselves when we avoid speaking about these painful subjects, because in the same way that a muscle will not grow without tearing, a believer will not grow without suffering. Jesus said, “These things I have spoken to you, that in Me you may have peace. In the world you have tribulation, but take courage; I have overcome the world.“1. As will be alluded too, believers go through three types of difficult situations in their Christian walk, persecutions, trials, and temptations. The idea is NOT that of; not (sorry for the use of the double negative, which is common in Greek) trusting something and therefore putting it through a trail to make it prove itself, but that the trial proves what was there all along. The root of the word trial was first used concerning the trying of iron with the idea that the ironsmith knew that the metal was without out alloy – was pure, but used the trying to display the reality of what he already knew. And in the process the iron grew in strength (All analogies break down at some point, the idea here is that all metal has some form of defect in the same way that all humans don’t hold a perfect faith or trust in God, otherwise man would be perfect and not a fallen creature. But as the iron is purged in the furnace, that process draws out infirmities making the iron more pure with each trial; such it is with the believer. No believer has perfect faith, yet faith is not and end result as some preach, it is a lifelong process of growth wherein the believer moves “from faith to faith” [Romans 1:17]; which is a synonym for exercising faith action unto another faith action. It is living from faith deed to faith deed as Romans 1:17 declares when it states: “the just shall live by faith.” ). God has given us His Holy Spirit to dwell within us, and God knows what we are made of, even those times when we will fail. Yet, as our faith is strengthened by going through trials, our faith is displayed for God’s glory, not our own. And if the metal is weak, the trying will address that. WE ARE NOT ON TRIAL AS IN THE US COURT SYSTEM WAY WHERE WE MAY BE CALLED INNOCENT UNTIL PROVEN GUILTY – BUT MUST STILL MUST DEFEND OURSELVES – NO WE ARE IN THE FIRE OF LIFE’S FURNACE GROWING IN FAITH, BEING PURIFIED IN FAITH, BEING MADE PROFITABLE IN THE LOVING HANDS OF OUR SMITH, WHO IS ALSO OUR ADOPTED FATHER, NOT TO TORTURE US; BUT TO GROW US INTO THE IMAGE OF HIS SON – TO GROW US IN FAITH. Temptations can come on their own (James 1:2), or can come when we are in a trial and the Devil is using our own desires trying to cause us to fall (James 1:14). Instead of following God and doing His will (1 Cor. 10:13), we fall back (backslide) into distrust of God and His provision. This lack of faith is a sinful response to a trying temptation type of situation. At this point Satan uses our own carnal nature to tempt us into further sin5. All of these situations can lead to sin. In persecutions, we don’t stay the course God has us on or we forsake trusting Him, while under attack from the devil. In trials, we can find ourselves in sin when we stop having faith in God, which turns into temptation because of our sinful desires. Temptation can take us out of the trial, soothe us, preoccupy us, or just make us feel better, or so we rationalize. Persecutions are outside evil forces bringing negative pressures on someone in direct connection to and in an effort to stop the Gospel of Jesus Christ. Mark 4:17 say’s concerning the Word of God being a seed to give life to the unsaved, that, “they have no firm root in themselves, but are only temporary; then, when affliction or persecution arises because of the word, immediately they fall away.” II Timothy 3:12 states, “and indeed, all who desire to live godly in Christ Jesus will be persecuted,” (NASB). Some trials come simply because we are human; sickness, accidents, disappointments, even unseemly tragedies. Other trials come because we are Christians. Peter emphasizes this in his first letter: ‘Beloved, think it not strange concerning the fiery trial which is to try you, as though some strange thing happened unto you.’7 Satan fights us, the world opposes us, and this makes for a life of battle. Jesus warned His disciples, ‘In the world you shall have tribulation’ (John 16:33). The key word is count. It is a financial term, and means to evaluate. Paul used it several times in Philippians 3. When Paul became a Christian, he evaluated his life and set new goals and priorities. Things that were once important to him became as dung9 to him in the light of his experience with Christ. When we face the trials of life, we must evaluate them in the light of what God is doing for us. This explains why the dedicated Christian can have joy in the midst of trials: he lives for the things that matter most. Evan our Lord was able to endure the cross because of ‘the joy that was set before Him,’10 the joy of returning to heaven and one day sharing His glory with His church. Know: An understanding mind. What do Christians know that makes it easier to face trials and benefit from them? Faith is always tested. God always test us to bring out the best; Satan tempts us to bring out the worst. The testing of our faith proves that we are born again. A gold prospector brings his ore sample into the assayer’s office to be tested. The sample itself may not be worth more than a few dollars, but the approval-the official statement about the ore-is worth millions! God’s approval of our faith is precious, because it assures us that our faith is genuine. Let: A surrendered will. God cannot build character without our cooperation. If we resist Him, then He chastens us into submission. But if we submit to Him, then He can accomplish His work. He is not satisfied with a halfway job. God wants a perfect work; He wants a finished product that is mature and complete. God’s goal for our lives is maturity. But God cannot work in us without our consent. There must be a surrendered will. If we try to go through trials without surrendered wills, we will end up more like immature children than mature adults. Why do we need wisdom when we are going through trials? Why not ask for strength, or grace, or even deliverance? For this reason: we need wisdom so we will not waste the opportunities God is giving us to mature. Wisdom helps us understand how to use these circumstances for our good and God’s glory. James not only explained what to ask for (wisdom), but he also described how to ask. We are to ask in faith. Temptations take place on the inside of man due to his lust, (desires). James 1:13-15 say’s, “Let no one say when he is tempted, “I am being tempted by God”; for God cannot be tempted by evil, and He Himself does not tempt anyone. But each one is tempted when he is carried away and enticed by his own lust. Then when lust has conceived, it gives birth to sin; and when sin is accomplished, it brings forth death.” (NASB). I Corinthians 10:13 say’s, “No temptation has overtaken you except such as is common to man; but God is faithful, who will not allow you to be tempted beyond what you are able, but with the temptation will also make the way of escape, that you may be able to bear it.” Temptation is not a tool of God, but a device of the Devil. He uses it in connection with our own carnal nature, which give it its power. Temptation starts in our heart in response our desires or to a trial we are in, when we fail the trial (doing God’s will), then our lust kicks in to turn the trial into a temptation and if not stopped it leads to sin. We must examine temptations by examining its connection to trials, and in light of the purpose of trials, which is to help us mature. 2. Mark 4:17; Acts 8:1, 11:19, 13:50; Romans 8:35; II Thessalonians 1:4. 4. I Peter 1:7; Romans 5:3-5; James 1:3,4. 8. “The Bible Exposition Commentary,” by Warren W. Wiersbe, Volume 2, pages 337-344, 1989 (sentence order changed and reworked for conciseness). 14. “The Complete WordStudy Dictionary,” by Spiros Zodhiates, 1992. I believe the thorn in the flesh is the constant persecution by those who oppose Paul. There was a bunch of jews who followed Paul from city to city stirring up trouble fro him, and turning the crowds against Paul. Hence it was a thorn for Paul. These people were messengers of Satan as they were doing the devil’s work in persecuting Paul. I doubt it is any sickness or physical weaknesses due to Paul’s tough as nails disposition. He has been whipped, ship wrecked and stoned to death- all without a single complain. Complaining about poor eyesight or sickness is out of character for Paul.